The year was 1975. At that time many Americans were concerned that the Cold War with Russia could turn hot. People all over the country were building bomb shelters in their backyards and storing large quantities of food. I was one of them. I didn’t build a shelter, but I did order $10,000 worth of Mountain House freeze dried food to be delivered to my home in Virginia Beach, Virginia. When the shipment arrived from Oregon, my family sampled some blueberries which we all liked. After that the food was stored in the attics of our house and garage. There it rested until August, 2007. My wife and I are in our 80s and our daughters, who live in Idaho, felt it was time we joined them. 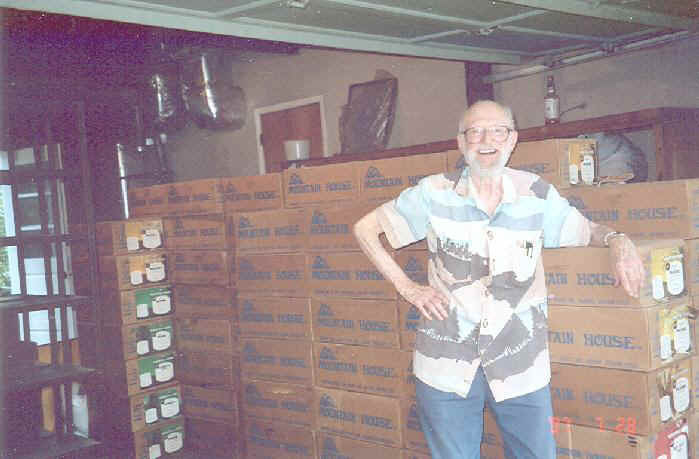 In August, 2007, we moved with all of our belongings and 227 cases of 32- year-old Mountain House freeze dried food. First we opened a can of peas. The moment I heard the swish air flowing into the can and felt their pellet-like hardness, I was convinced no air had entered the can for 32 years. The peas were fine. We checked the blueberries and found them to taste exactly as we remembered them in 1975; the strawberries also kept perfectly. Since then we have twice served the scrambled egg mix. The added flavor of butter and salt were perfect to our taste. Are we again approaching uncertain times that could affect the food supply? Will my decision to "stock up" during the Cold War 32 years ago soon be transformed from folly to fortune? In any event, it is an honor to be in a position where I can safely say that freeze-dried food packed by Mountain House in 1975 (#10 cans, six cans per case), is still perfectly preserved after all these years. This page was last modified on March 12, 2019 .